A mighty medical event occurred half a century ago, when the curse of polio—of youthful paralysis and suffocating death—was conquered. 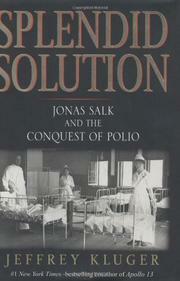 It was then that the vaccine developed by Dr. Salk was pronounced safe and effective and mass inoculations began. There was Jenner in the 18th century, Pasteur in the 19th. Add, for the 20th, Jonas Salk (1914–95). Time writer Kluger (Moon Hunters, 1999) tells the story of the able and ambitious young researcher who launched his battle against the awful illness back when Franklin Roosevelt, most prominent among the disease’s many victims, sponsored the National Foundation for Infantile Paralysis (now the March of Dimes) under the direction of his law partner, Basil O’Connor. O’Connor’s name, the palliative treatments of Sister Kenny, or the fearsome contraption, the Iron Lung, may now be largely forgotten—thanks to the efforts of scientists like Salk, who was happily diverted from law or rabbinical studies to City College and NYU Medical School, and then, during WWII, to research on a flu vaccine. Kluger tells the stories of individual victims of polio. He notes the political infighting and describes the establishment of the Pittsburgh lab. He salutes the sacrificial monkeys and mice and recognizes the painstaking task of isolating strains and types of the disease. The science is made accessible, though sometimes it’s freely dramatized, as, for example, in the personification of little pathogens. Salk’s investigations were devoted to the use of killed virus, to be administered by needle. Albert Sabin, depicted as his everlasting nemesis, promoted the use of live virus, given by sugar cube. (Only recently was the Sabin method fully phased out.) Among the first vaccinated: Salk’s lab colleagues, his family, and himself. While Kluger does recall the excitement of the announcement 50 years ago, he scants the inventor’s life story thereafter. Still, in this unabashedly laudatory history, the story of the achievement is a terrific one.